Supreme comfort in a terrific waterview home with luxurious outdoor hot tub. Enjoy the great views, starry skies, and privacy from this spacious contemporary on a quiet cul-de-sac. Privacy abounds. This wonderfully furnished home is lovingly decorated. 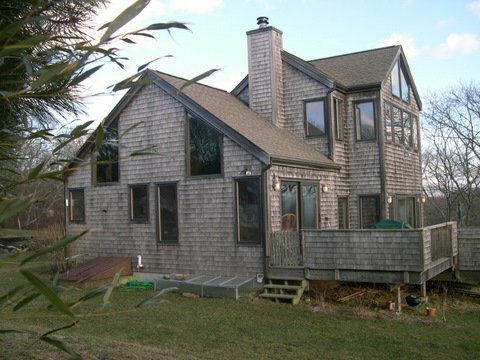 Large decks and lots of windows, sliders out to a huge deck, cozy reading nooks, plenty of space between the 4 bedrooms, each with ocean views. A sweet and fragrant perennial garden, flowering border plantings and an eco-minded owner (solar power) are very attentive to the comfort of their guests. A very unique and wonderful place to stay. An extensive library of books will keep you entertained during leisurely days, and cozy evenings by the fire.